This reached its peak last month when I returned to Colorado from NY. I drive with an (old fashioned) CD changer with 6 discs (all Lightfoot), and then I pop other single CDs into the slot in the console. CDs by Hamilton Camp, Michael Jerling, Steve Gillette & Cindy Mangsen, Meridian Green, and David Mallett (and others) have occupied that slot. I then play some Lightfoot, that CD, and then some more Lightfoot. Anyhow, on this trip (actually, on the July trip East as well), that slot was occupied by The Cottar's CD, Feast (Amazon.com link, Amazon.ca link, Amazon.co.uk link). The Cottars are a young quartet, actually in a 2nd configuration. 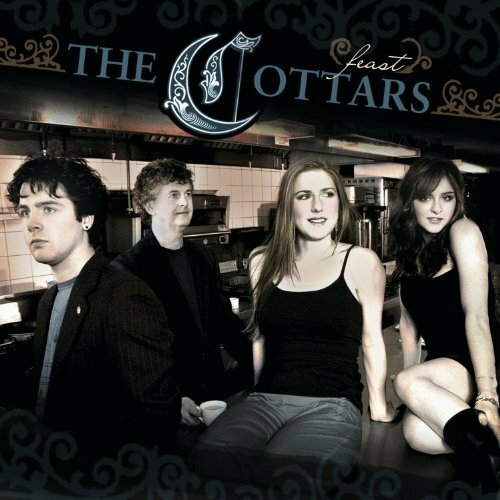 Two of the performers, brother and sister, Ciaràn (vocals, piano, guitar, more) and Fiona MacGillivray (vocals, piano, more), were on the previous Cottars album; two are new on this album, Claire Pettit (vocals, fiddle, viola) and Bruce Timmins (vocals, guitars), a well-respected session player. But there is nothing "beginner-like" about this CD. Their music is a blend of Celtic, Cape Breton (where they are from), bluegrass and folk. The musicianship is nothing short of extraordinary; the vocals beautiful; the songwriting on their original tunes accomplished as well. The Lightfoot cover that first caught my attention is of one of his less known tunes; one that only a real fan would know by name. It's on the If You Could Read My Mind original album (now being sold under its original name, Sit Down Young Stranger) and it's called "Your Love's Return (Song for Stephen Foster)". It is, as the parenthetical portion of the title says, a tribute to Foster, in whose music Lightfoot had become interested at the time. It's a sentimental love song, very Foster-like. The Cottars took this tune, with Fiona singing the lead vocals (not changing any lyrics which were written for a man to sing), added their own string arrangement and harmonies, and created something all their own yet faithful and respectful of the Lightfoot original. You can listen to the entire song on You Tube. Amazing, isn't it? I am certain that Lightfoot is pleased with their cover, as he must be with the much more mainstream Toby Keith cover of "Sundown" (discussed elsewhere). Ciaràn is quoted in the liner notes as saying that the Lightfoot song just might be his favorite on the CD, and that is high praise as the disc is full of wonderful songs. In addition to the Lightfoot tune, there are several other standout tracks, and - as I already said - at least one person - me - can listen to it from start to finish repeatedly and enjoy it every time. (In fact, the only other tune to get prominent play on my trip was "Wreck", which I always play going into, through and out of Cleveland - sometimes at a high decibal level). My favorites among the other tunes are the Mark Knopfler cover, "Fare Thee Well, Northumberland", "The 23rd of June" - the Tommy Makem rewrite of the Irish traditional song, "Jug of Punch" - and the wonderful "Seagull", written by Steeleye Span's Peter Knight, and from which the subtitle of this article is taken. The CD is available from Amazon (links: US, Canada, UK link).. I received a review copy of this CD from the artists.